This recipe I’m sharing with you is actually one I make on a pretty regular basis. This is mainly because it’s so ridiculously easy and doesn’t involve a ton of fancy ingredients and only takes around 15 minutes to make. In addition to this, it’s also really tasty, especially considering that all the ingredients are pretty basic. The list of ingredients below is what I happened to have left in the fridge on this occasion however I regularly swap these for alternatives and as long as there’s a couple of root vegetables and some sort of onion it works. If I’m trying to make it lighter I won’t use a potato and to be honest I use regular old white onions more often than spring onions but the spring onions looked like they were going to go off first so I used them this time. A handful of frozen peas thrown in towards the end also works really well. 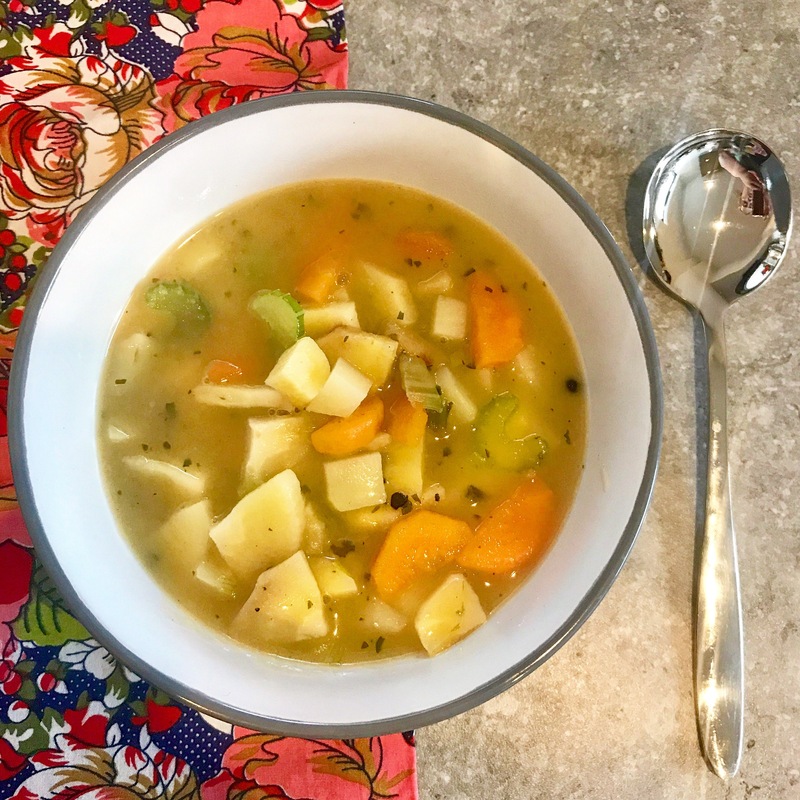 Soup might seem like an odd thing to be cooking in the summer months but as this is so quick to make and so fresh I actually find it to be a really good light summer meal. It’s easy to make in large batches therefore ideal for freezing or for packed lunches, however I most often have it as a light dinner on those kinds of evenings where you’re tired and hungry and just want something quick and filling that’s not too complicated or laborious. Feel free to mess around with my recipe and ingredients and use your favourite vegetables, just be sure to dice them all to a similar size (around 1 cm cube) to ensure nothing takes too long to cook through. I like my soup chunky but if you’re into smoother soups use a hand blender to whizz it up or allow to cool before putting it through a food processor. 1. Dice all vegetables to approx. 1cm cube. 2. Add the oil to a large saucepan on a medium heat. 3. When the oil is hot throw in all your vegetables and dried herbs and sautée gently until everything has softened. 4. Sprinkle in the flour and stir to coat all the vegetables, cook for another minute. 5. Add the vegetable stock and turn up the temperature to bring to a boil. 6. Reduce to a simmer and allow to cook for a further 5 mins or until soup has thickened. 7. Season well with salt and pepper. 8. If you like your soups a little smoother use a hand blender to whizz this up now, if you prefer it chunky like me then dish up and tuck in!